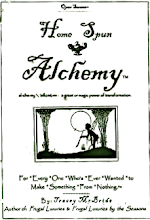 Simple Pleasures and Homespun Alchemy™ to Enhance Your Life and Comfort Your Soul. love these candle disguises..thanks for the fab ideas..
Terrie,so lovely to see your name! My best thoughts and prayers are with you for a happy and healthy 2010. Blessings and good thoughts. I love your little felted card...so darling!! Thanks so much for the kind comments!! Carol... You are doing some amazingly creative things with little snippets of fabric--you always amaze me to no end. To top that off you give away so many of your creations...to those needing warmth and comfort. Now THAT is creativity...and love. Bettyann, thank you so much for the good thoughts! Your frugal baby cashmere sweater is soo charming!! I will enjoy seeing it trimmed out! Tracey, you posses magical powers don't you? 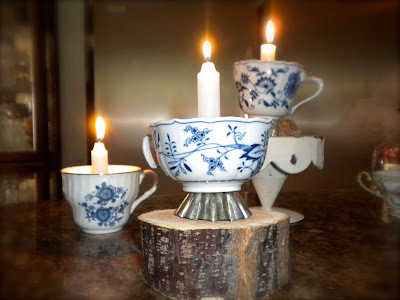 How else did you get those candles to stand up in those tea cups? LOL! Well, like the Wizard in Oz I have a little help behind my curtain...it's called earthquke wax aka picture putty and the like!! 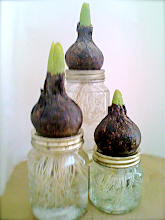 I'll be posting a pictorial how-to tomorrow on how easy these are to put together...from inspiration to illumination!! I would do it tonight but I'm down at my Dad's house for the Rose Bowl and dinner and all my pics are on my home computer! It will be on my Season's blog but I'll post a link here. Sorry if this isrssy as I'm using my new iPhone and it is so sensitive! Thanks so much for the fun comment!! Thank you Clarice!! 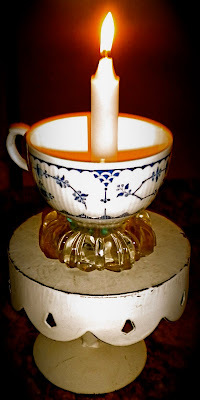 The candle stands up using a picture putty/earthquake wax. I will post details in just a little bit! I just finished "A House With Four Rooms" last week! How funny that you should use a quote by her. Love them! That is so funny! "There are no coincidences" as the saying goes. I've never read "A House With Four Rooms" but I have read "In This House of Breed" and it was so insightful and very, very thought provoking. Rumor Godden is a wonderful writer. how are you my beautiful friend? how's your family? i pray all is well. how was your week? are you enjoying our weather? i feel so bad because the rest of the country is really suffering. i tivo "Good Morning America" everyday, and this morning i could not believe what i heard, it is snowing in Florida. i was so shocked. i know the locals are just wondering what in the world is going on. my heart really goes out to all the farmers. i saw some in Florida trying to save the oranges and strawberries. i really have been keeping them in my prayers. there you go with your amazing creations. these are just beautiful! love them! you are so amazingly creative my friend. i'll make sure i check out how you did this. very pretty. love the mason jar ideas below too. now that the New Year is here, i'm on a mission to lose the weight that i have been lazy with trying to lose. so far since the 29 of December i've lost 8 pounds. i was shock the 8 pounds came of so quick. but you know what i did, i completely removed sugar from my diet. if i do have some sweet its raw honey and raw sugar in moderation. i also got off of regular whole grain bread and i am now really loving this bread called Ezekiel 4:9 bread. it is really good. they have everything from sliced sandwich bread, bagels, hamburger buns, tortillas and pita. i really do love it. the bread is all sprouted grains. it really is healthy. i eat 6 small meals a day. the worse thing you can do is starve yourself so i make sure i have a balance of everything. but i'm going to stay off that scale and just go by inches. see my problem is, i can be doing so well with losing my weight, and then i cheat. so this time i really am making it more spiritual. i wake up every morning and pray and meditate and then i read my bible. i decided to read through the bible this year, it is so interesting and amazing. right now i'm reading Genesis 19, i also read a chapter each of Psalms, Proverbs and Matthew. this really has been a blessing to me, i really enjoy reading just how powerful God is. i feel great! i think the personal time helps keep my mind off of other things that may be on my mind and then i forget my new way of eating and grab a cookie that's been looking at me. you know how those cookies, cakes and brownies talk to us. speaking of cookies, last night while i was in Fresh n Easy store, these cookies were looking at me, but i had a plan, i looked at those chocolate chewy things, rolled my eyes and walked away. and then i bumped right into the tortilla chips and salsa, LOL!!!! why is it that they put the cookies right by the soy milk section? speaking of how great God is, you telling me that the young man was trapped in a burning car and came out with no burns? Wow, God is amazing!!! that's a miracle. how is he doing now? how's his family, his mother? i pray all is well with them and that he has a miracle recovery. so your baby is back in school? how is that little beauty doing? both of your beautiful girls and your son? josh returns back tomorrow. he said he couldn't wait to get back to school. I love your biblical perspective on diet. It just makes sense when think about it. Oh my goodness, our weather is so spring~like lately. When I hear about what's going on back east and even in the southern states I literally say a prayer of appreciation for our mild climate along with a prayer for those who live there. To think I used to wish I lived where it snowed! I'm off now to post a few pictures and then hand over the computer to the kids. Thank you my sweet friend for all the good thoughts, prayers and kind words...I feel and see them at work all the time. Please know you and your family are included in our constant prayers as well. God bless and keep you and your family well and happy. Wonderful idea!! I have one of the blue cups just like yours!! Thank you Susan! 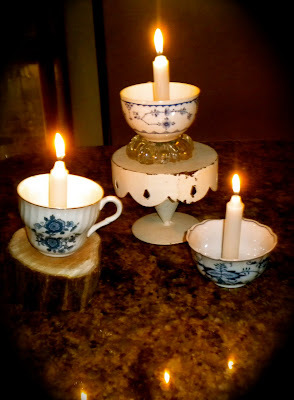 Your thrifted rose cups would look cute with candles in them too! A warm Thank You to all kind souls and kindred spirits who generously take the time to leave a comment...your encouragement, trust and support are deeply appreciated...please know that we read each and every message and will respond as time allows. Frugal Luxuries™ is a registered trademark. 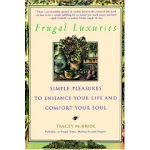 "FRUGAL LUXURIES: Simple Pleasures to Enhance Your Life and Comfort Your Soul" was written by Tracey McBride and published by Bantam Books, NY, in 1997. It was the first of its genre to synergize the elements of simplicity, frugality and gracious living. After more than a decade, FRUGAL LUXURIES has never been out of print and is now more relevant than ever. "It's our hope that a new generation, faced with a teetering economy, will also find this information helpful and enlightening." Sending Good Thought to Our Special Band of Kind and Kindred Souls! Lovely Charming & a Little Bit Whimsical! 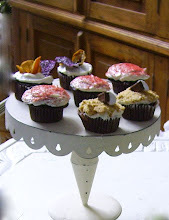 Blogger puts cookies on all their blogs and this blog uses Blogger to publish. Please know you may opt out by not visiting here. This notice is geared to all of our visitors but specifically for our European visitors. We are lucky to have you. Legal: Frugal Luxuries Blog is a participant in the Amazon Services LLC Associates Program designed to provide a means for sites to earn advertising fees by advertising and linking to frugalluxuries at Amazon.com. Simple Life-style Advocate and author, Tracey McBride, is known for creating and coining the phrases "Frugal Luxury" and "Frugal Luxuries" as far back as as 1993. In fact..."Frugal Luxuries" (R) is a registered and copyrighted phrase in/by the United States Trademark and Copyright offices! Tales of an Intermittent Blogger! For all who value both the material and intangible aspects of existence. "Keep your eyes open to your mercies. The man who forgets to be thankful has fallen asleep in life." Welcome...we're lucky to have you!!! "We are lovers of beauty without extravagance." 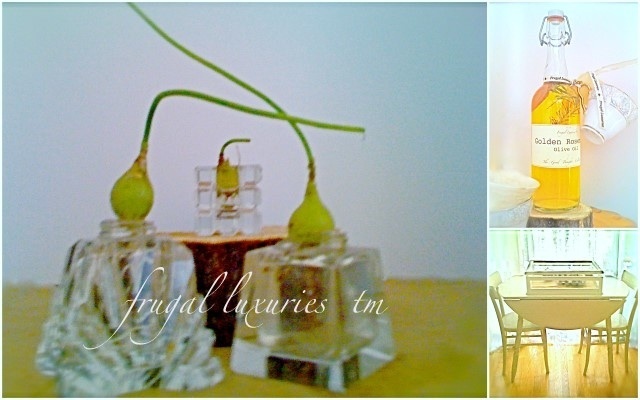 Our newsletter Frugal Luxuries* was established in 1993. Our goal was...and remains...to blend beauty, grace, and spirit with the practical details of living. Regular features such as Home Peace; Creative Recycling of the Ordinary; Homespun Alchemy™; Kindred Spirits; Every Day a Feast; and our longtime favorite...Frugal Luxuries®, have been a breeding ground for the alchemy that transforms the ordinary into the extraordinary. You are warmly invited to mingle minds, exchange ideas and comfort your soul via the philosophy of frugal luxuries. *Originally titled Frugal Times: Making~Do With Dignity until 1997 when it was permanently changed to the title of our long-time, back~page feature Frugal Luxuries. 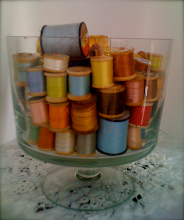 Sixties era trifle bowl cradles a vintage thread collection. 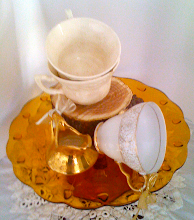 Thrifted teacups and creamers are useful components of the Gift Pantry tm. 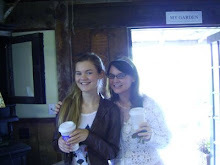 What Katie Did...Rosie and Momma Too! To live content with small means...to seek elegance rather than luxury, and refinement rather than fashion...to be worthy, not respectable, and wealthy, not rich...to study hard, think quietly, talk gently, act frankly...to listen to stars and birds, to babes and sages, with open heart...to bear all cheerfully, do all bravely, await occasions, never hurry...in a word, to let the spiritual, unbidden and unconscious...grow up through the common...this is to be my symphony. Note: Words to live by. This poignant quote touches me more now than when I used it in my first book, Frugal Luxuries, Bantam Books, NY, NY, in 1997. Guest Post: The Lovely Luxury of a Foot Massage! Enchanting...Vintage... French... Paper Dolls... Free!! Wallflower ~~~~~~~ To see more click HERE . Some images displayed on this site are copyrighted and/or trademarked. They are used here only for purposes of personal enjoyment, education or critical review. All rights are reserved by the owners stated and unstated. Caution: All information put forth on this site is offered purely for entertainment and speculation. The site owners and/or operators and writers/authors are not resposible for inaccurate or incomplete information published here. Use your good judgement before implementing or following any information put forth on this or any website. Our code of ethics: Garner value for goods and services without being dishonest or taking advantage of any individual, group or business. The phrase Frugal Luxuries is a registered trademark with the United States Trademark and Copyright Office.